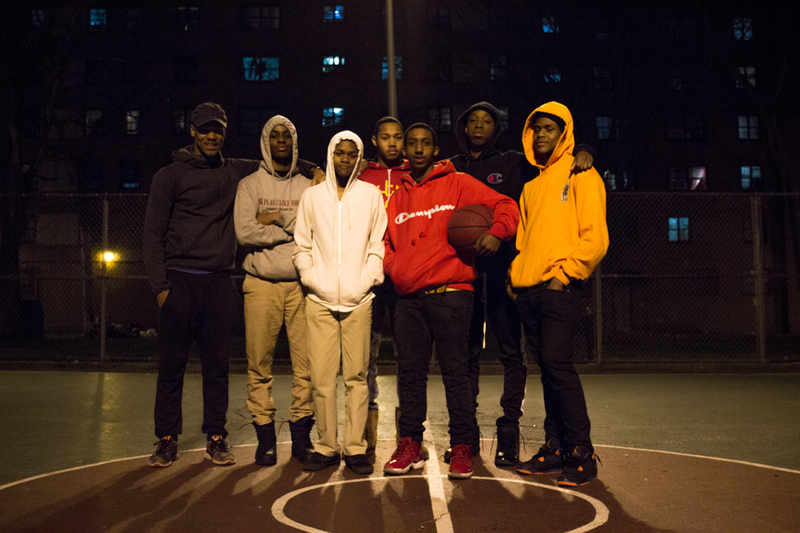 Baller City: Can A Basketball Tournament At The Grant Houses Change What It Means To Invest In The Youth? When Harold Benjamin, the founder of Baller City Basketball reached out to me six weeks ago, he had one concern: the summer. The weekend before we met, a shooting took place outside the General Grant Houses, north of La Salle, in between Broadway and Amsterdam. One of the bystanders who got injured was a former basketball player of his. No arrests had been made but four men on motorcycles were spotted fleeing the scene. Baller City Basketball is a summer youth basketball program and tournament based in the General Grant Houses. 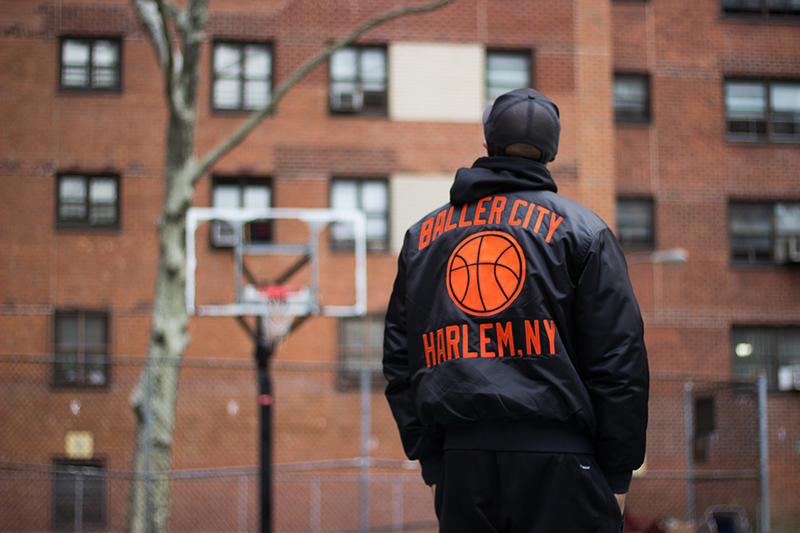 In the seven summers that Baller City operated, the program served over 200 kids all over West Harlem from ages 12 to 18. This will be the second year in a row that Baller City is unable to run due to a lack of funding. Harold chokes up when he tells me this. Although he’s been breaking the bad news for almost two years now, he still struggles to find the right words to explain what happened. 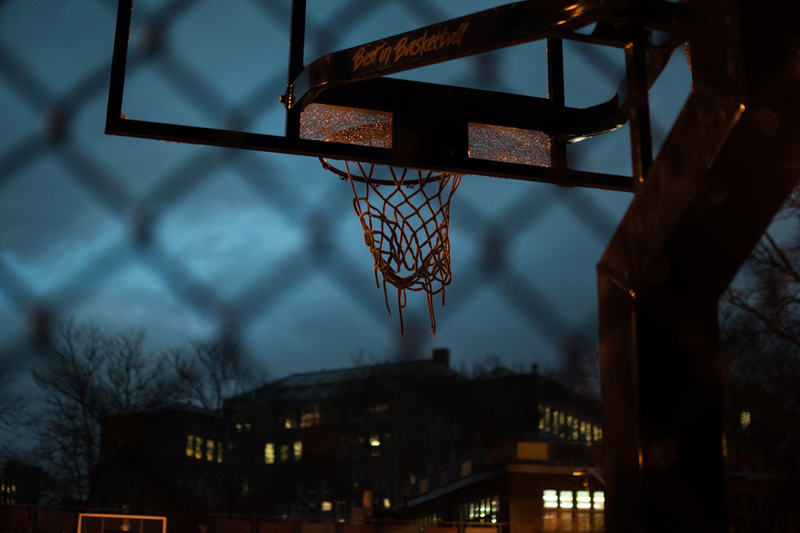 New York City has often been considered “basketball Mecca.” The late sportswriter Pete Axthelm considered the sport inherently a “city game” where much of its popularity stems from the way makeshift courts and hoops can emerge despite the city’s lack of space and resources. 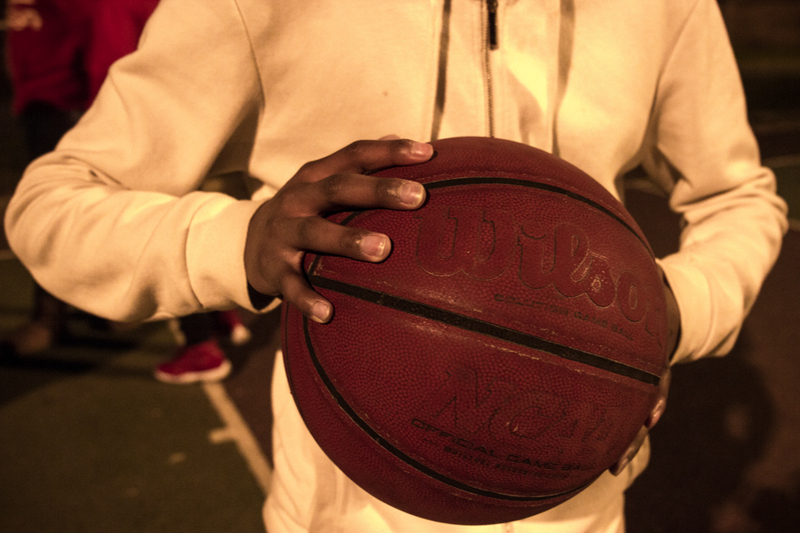 From the park to the gymnasium, basketball is never too far out of reach in the city. 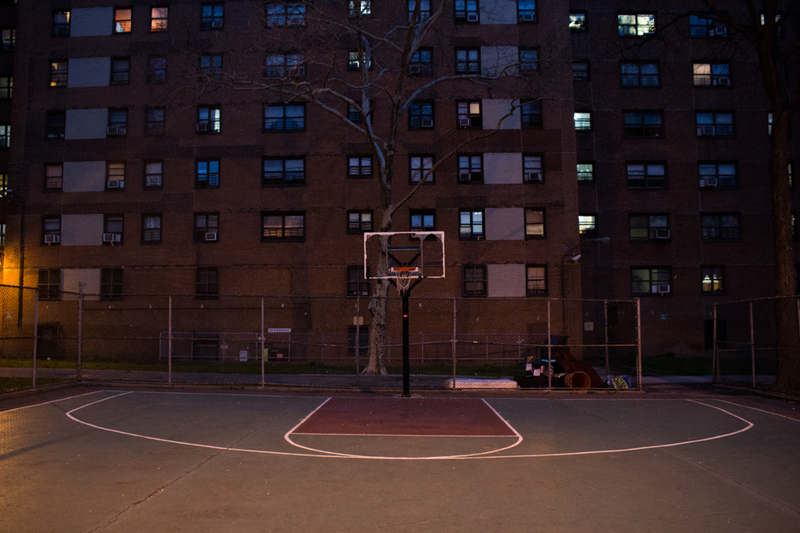 In his book “The City Game: Basketball from the Garden to the Playgrounds,” Axthelm wrote, “Other young athletes may learn basketball, but city kids live it.” For many kids, basketball has been, by both a combination of design and serendipity, not just a form of leisure, but structure. 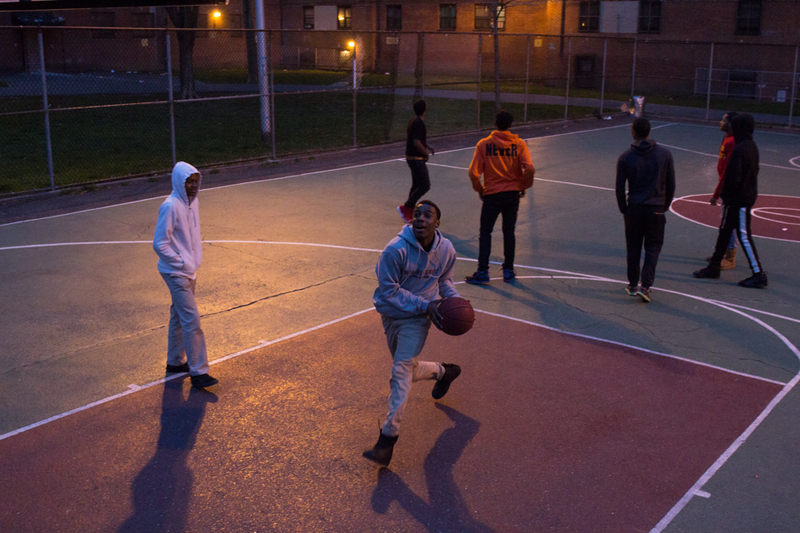 Basketball courts in West Harlem are lodged in parks, playgrounds, and gymnasiums. There’s Riverbank State Park, Riverside Church, the St. Nicholas Park, P.S. 125. But now with funds provided through Columbia University, the U.S. Department of Housing and Urban Development, and local officials, the possibilities of what kinds of resources and opportunities are available to kids in West Harlem stretch far and wide. 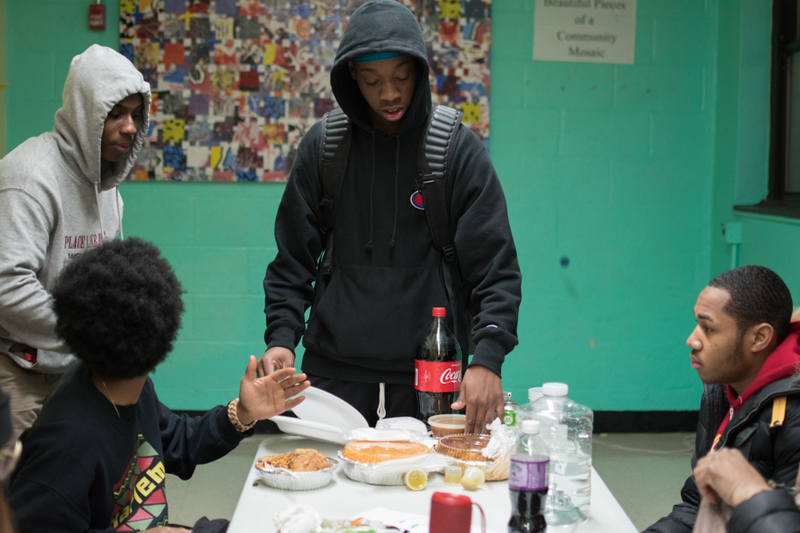 There are STEM programs, tech camp, film production, figure skating, and squash—just to name a few—all located in West Harlem. With all these new avenues and opportunities, more and more people are questioning whether basketball programs are still worth funding? I ask Harold where he’s from, and he explains it like this: Growing up, the South Bronx was where his bed was, his shelter—but the Grant Houses, that was home. His maternal and paternal grandparents lived next door from one another in the Grant Houses and that’s eventually how his parents met. When his mom gave birth to Harold, they decided to move, but Harold’s ties to Harlem and the Grant Houses remained strong. Every day after school, he hung out at the Grant Houses. 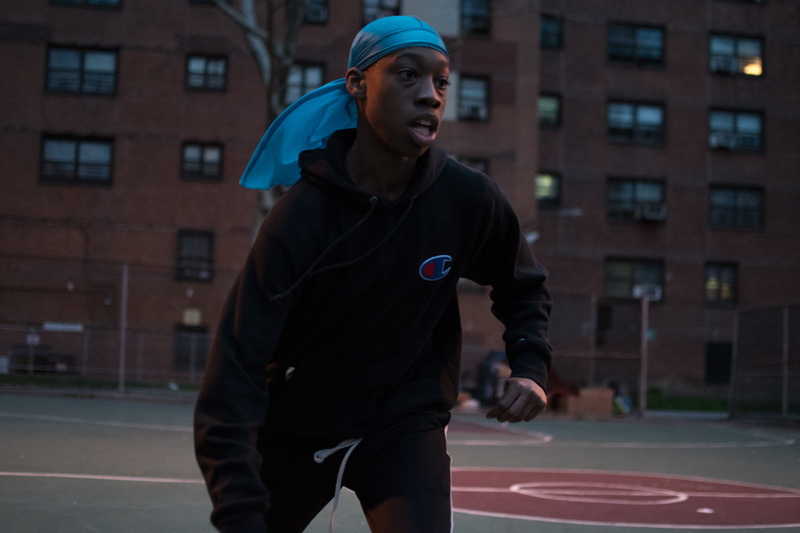 When he first went to the gymnasium at Riverside Church in ninth grade, all he was looking for was another space to play basketball with his friends. Harold retreated to Riverside every Friday and eventually met Rev. Dr. Mariah Ann Britton, Riverside’s youth coordinator at the time. Rev. Britton wore thick rimmed glasses and had black hair that waved outward just above her shoulders. When Harold describes her, she sounds familiar—we all had a Rev. Britton in our childhood. It was she who had put Harold in a headlock and mentored him into young adulthood, and then manhood. She showed Harold what it looked like to never give up on someone. Senior year of college, in 2004, Harold was approached by three parents from the Grant Houses, because he had become known for playing basketball there. They told Harold that the kids in Grant had nothing to do in the summertime and that something needed to be done about it. It wasn’t a suggestion, but an order. 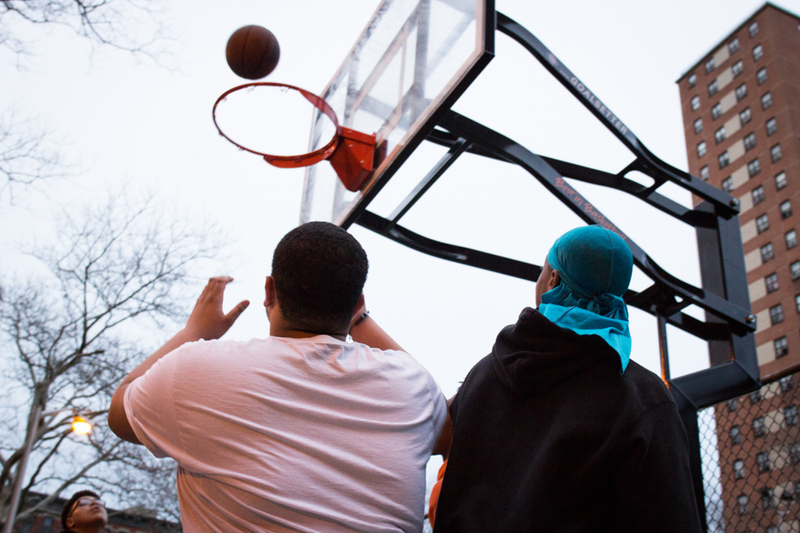 Harold established “Baller City” in 2009 and organized the first few basketball games on the concrete court of the Grant Houses. The following year, Harold formed a set of teams and planned a roster for the summer. That’s when the real program kicked off. The curves and contours of the landscape around the Grant Houses don’t render on Google Maps satellite images. The hill slopes down so gradually it might take the walk all the way up to its peak to feel any sense of height. The red brick clashes with the forest green trees which clashes with the silver cement. The buildings loom so high that just looking up at the roof can make a person feel dizzy. It’s a late Thursday night when Cortland Blackwell, an 18-year-old from the Grant Houses, travels across the housing complex and into the Grant Houses Community Center. He uses the back entrance because it’s the quickest way to get to the children’s classroom in the basement, which is empty at night. 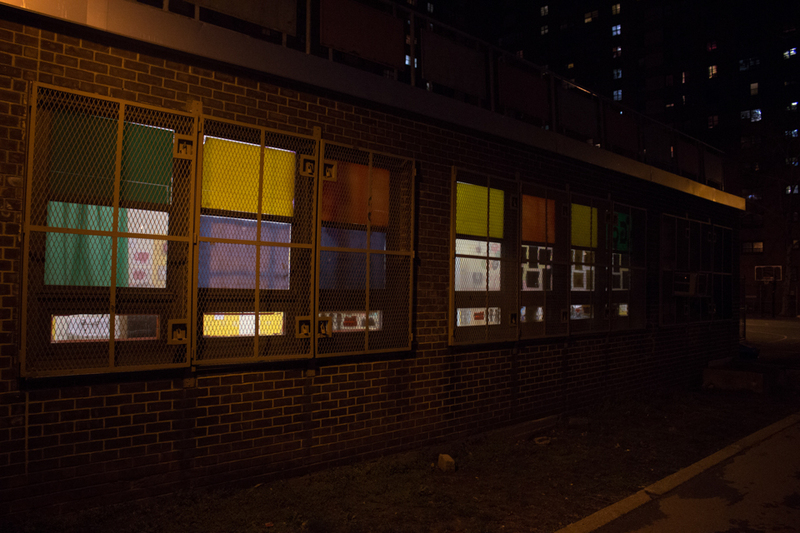 The classroom’s brick walls have been coated with neon yellow and blue paint. The periwinkle bookshelf contrasts with the tangerine closet doors. A row of children’s artwork is hung on the wall, all saying in different colors and style, “I’m Black and Proud”. One friend is rocking back and forth in a bright yellow child-sized chair that makes him appear twice as big. Another friend is sleeping on a chair in the back of the classroom. Three others are waiting silently for their friend to return from the deli with chips. They’re bored, they’re chillin’, but hanging out here is better than hanging outside. Baller City was never really about basketball. Yes “basketball happens” but to Harold, the tournament is an opportunity to reel kids in and improve the community’s quality of living. 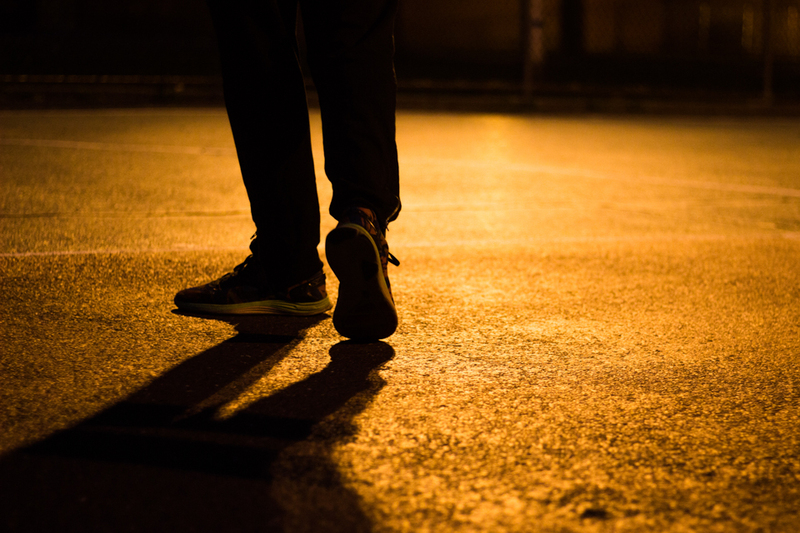 With the help of Sarah Martin, former president of the Grant Houses Residents Association, Harold also coordinated workshops—on police relations, drug use, and staying fit—for those who participated in his program. Baller City is also important to the spectators. One year, a parent thanked Harold after a tournament. He was perplexed. The parent’s daughter didn’t participate in the games nor was she part of the general program. When Harold asked why he was being thanked, the parent said he was happy to know his daughter was out and not to have to worry because she was at the tournament. Cortland, Wali, Kendall, Shawn, and Dayon are all from the Grant Houses. They grew up watching Harold’s summer tournaments, and when they were old enough, they joined the tournament themselves. Harold gave all the kids nicknames. Around the table, Cortland and his friends tell me theirs. “Shawny Shawn. Double S.,” Shawn says proudly. “Ssssss-Agua or Ssss-Water,” Cortland hisses. “Double D…,” Dayon doesn’t like his very much. 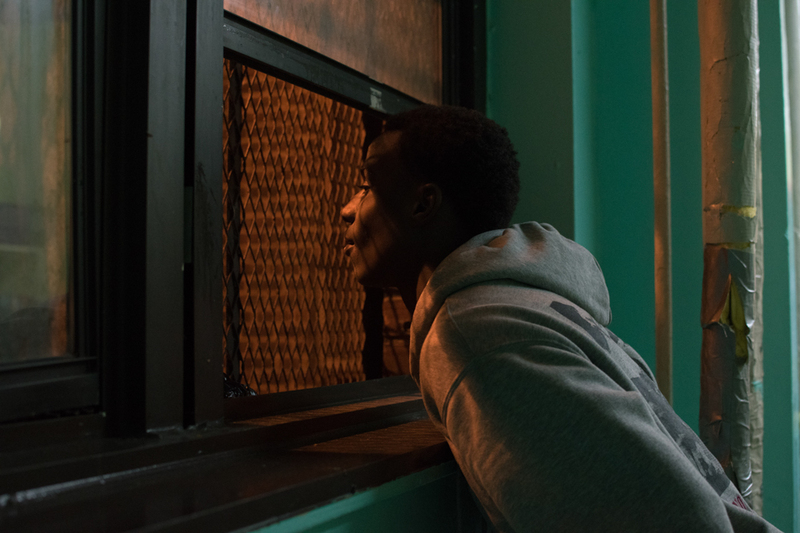 The simple task of returning home safely and peacefully seems mundane, but according to Harold, it’s a meaningful achievement for many teenagers in the Grant and Manhattanville Houses. He tells me the past two decades have been affected by shootings and tension between young people. “Terrorism” is how Harold describes it. Two gangs, Money Avenue and Make It Happen Boys, reside in the Manhattanville Houses, while 3 Stacc has its origins in Grant. According to the New York Times, the turf war between the three gangs was responsible for 19 nonfatal shootings, between January 2010 and May 2014. In June of 2014, the Grant and Manhattanville Houses underwent the largest New York City Police Department gang raid in the city’s history at the time. Operation Crew Cut Initiative included around 400 police officers entering the two housing complexes, indictments on over 100 suspected gang members, and 40 arrests on the spot. But does removing the gang members remove the gang? In most cases, “after the sweep, the fundamental challenges in the neighborhood haven’t been addressed,” Jason Ziedenberg, Director of Policy and Research at the Justice Policy Institute in Washington, told the Boston Globe in 2016. Although both the 26th Precinct and community members agree that crime has decreased across the two housing complexes since 2014, some tension between the Grant and Manhattanville Houses still remains. What Rev. Britton taught Harold was that it’s the roughest kids you don’t let go. Harold opens up to tell me that he doesn’t know if he could change some teenagers, but he quickly comes to the conclusion that maybe that isn’t his job. Instead, he works toward trying to change the culture and the kids’ approach to what is going on in the neighborhood. Harold recalls one game where he had kids from the Grant Houses and Manhattanville Houses play together. “It’s kind of a big deal.” Harold says. “We used the tournament to resolve the beef,” Cortland explains over garlic knots at iPizzaNY, a pizzeria on 9th Avenue. 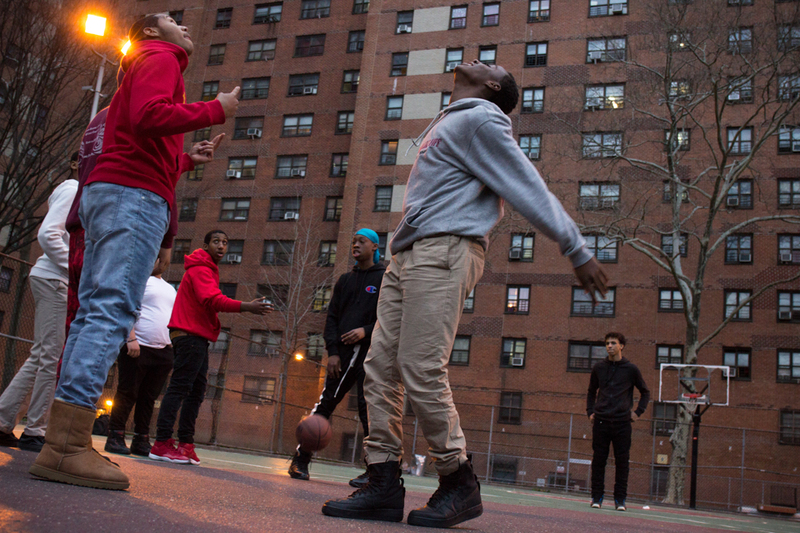 For Cortland, Baller City created one of those rare spaces where kids from different public housing projects could come together and play ball peacefully. Sometimes the police would oversee the games—just in case—but to Cortland, there was no use for them. As he talks, Shawn and Kendall reach for the last garlic knot on the plate. The two look up, lock eyes, then pick up the garlic knot together. “See, this is how Baller City makes peace,” Shawn jokes. The two gently break it in half, eat their fair share, and the rest is history. Kendall, Wali, Dayon, and Shawn sit around the table while Cortland stands. His excuse is that there’s no space around the table, but it feels appropriate and expected for Cortland, the oldest of the group, to hover over the other four, almost parentally. The five all share an interest in basketball, but what seems even more unifying is their unspoken desire to stay out of trouble. The group of teenagers don’t know when the tension between the Grant and Manhattanville Houses began, they just know it’s been a long time. But it actually hasn’t been: When Harold was growing up, there wasn’t this much tension between the two houses. There was still the occasional scrimmages and crime incidents in the area, but the extent of the rivalry between the two houses, residents of both the Grant Houses and Manhattanville Houses believe, was exercised through sports. When the Morningside Heights Housing Corporation proposed constructing the Grant Houses in 1954, it wasn’t an initiative to build new low-income housing, but rather a compulsory footnote to their more well-received proposal to create a middle-income cooperative, Morningside Gardens, across the street. The ten buildings that make up the public housing complex were built on the burial ground of demolished tenement buildings. Columbia University was at the forefront of the slum clearance and construction of the middle-income cooperative, along with leaders from eight neighboring institutions in the Morningside and Manhattanville area, which worked together as Morningside Heights Housing Corporation. But even in 1955, the University planned to use cultural and athletic youth programs to improve community relations with the residents at the Grant and Manhattanville Houses. 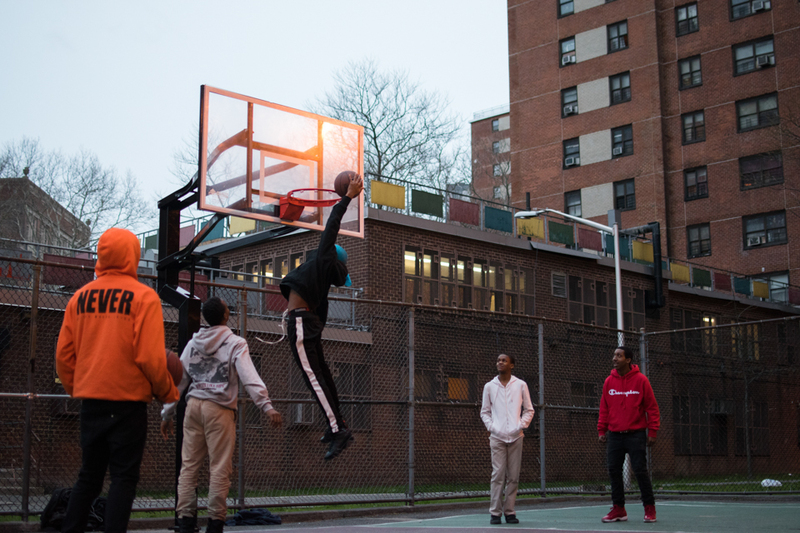 Although the University does not provide any youth programs that specifically cater to kids from the Grant or Manhattanville Houses, more than 60 years later, it continues to offer sports programs, tutoring, and scholarships to engage with the all of the youth, including the two houses, in the community. This form of engagement was further expanded through the Community Benefits Agreement. When the University and West Harlem Local Development Corporation began negotiating the resources and funds Columbia should contribute for the Manhattanville expansion, it was Sarah Martin and Maritta Dunn, board members representing the Grant Houses and Manhattanville Houses respectively, that made the two houses a priority. In the end, the two public housing complexes were promised a collective three million dollars out of the overall $150 million Columbia was to contribute to the community as part of the CBA. The fund is managed and best understood by the Manhattanville Houses and General Grant Houses Benefit Committee. The name is a mouthful, but the group consists of less than ten people: the tenant association presidents of both houses, the managers of both houses, and two representatives from the New York City Housing Authority. But because the group hasn’t filed a 501(c)(3) to become a legally recognized corporation, the West Harlem Development Corporation serves as a fiscal sponsor. For example, let’s say the tenant association president of the Grant Houses is interested in establishing a garden using money from the CBA: They would write a proposal, have the manager of the Grant Houses sign off on it, get it approved by the rest of the committee members, and then send it to the WHDC. Finally, after processing the proposal, the WHDC would give the committee a check with the funds required for the garden. According to the WHDC, the committee has spent almost $500,000 of the $1.1 million that’s been deposited. In 2006, Harold’s mother passed away. When he received a check from her insurance company, he used the money to fund the first two years of Baller City. When Martin heard that Harold was paying out of his own pocket, she immediately reached out to him to help. 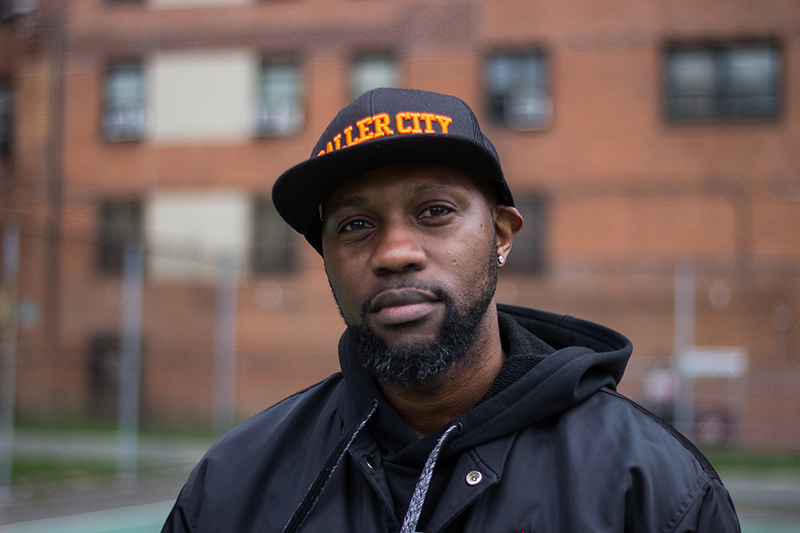 Martin helped raise funds for Baller City until she left the Grant Houses in 2014 using the Tenant Participation Activity funds provided by the US Department of Housing and Urban Development. When Martin moved out of the Grant Houses, the Manhattanville and Grant committee continued to help fund Harold’s basketball program for two more years through the CBA funds. But before the summer of 2017, the committee chose to withdraw funding for the program. When Cortland walks into the Community Center, one night because it’s too cold to play, the rhythmic stomps of step dance echo throughout the staircase. Pop music is playing from a dance studio, a teenager is doing math homework in the hallway, and adults run around from meeting to meeting. I check the time—it’s almost 9 p.m. When Martin moved to East Harlem, Carlton Davis became the new president of the resident association. Like Martin, Davis believes the CBA funds should be used to invest in the kids. In 2016, Davis arranged for the organization Mosholu Montefiore Community Center to settle a base in the Grant Community Center. Only two years in, MMCC hosts trips to colleges and Six Flags and runs various after-school programs such as karate and dance. 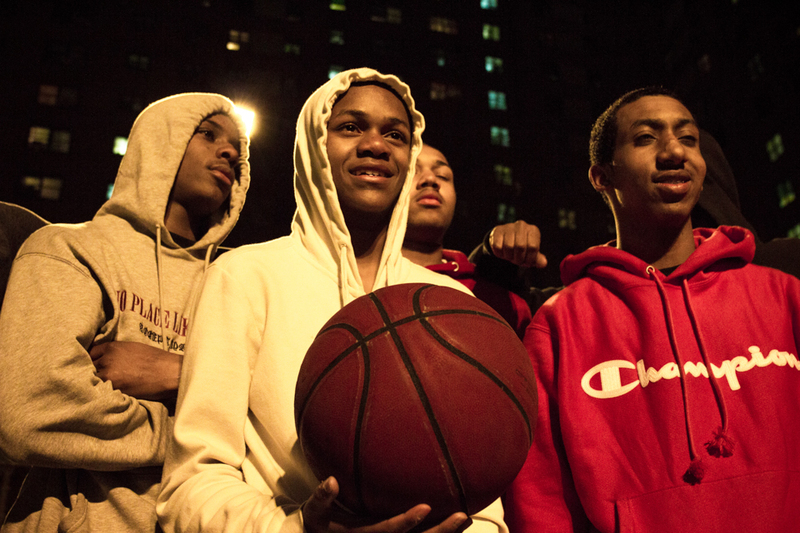 At the heart of the matter, the drama that surrounds Baller City’s defunding is less about the the program’s success than the prioritization of other programs. Davis agrees that basketball can help shape a kid’s life—he even acknowledges that the sport helped him out when he was a child himself. Davis admits that Baller City helped relieve some tension between kids in the neighborhood, but “now we need people to respond more to a cleaner, healthier, Grant”. That’s Davis’s motto. In April, Davis organized a health and wellness event and a health fair at the Grant Houses. He plans on renovating the field at Grant and putting down artificial turf so that kids can have a space to play soccer, volleyball, and baseball. Basketball wasn’t on his list. In August 2017, Harold emailed Kofi Boateng, the executive director of the WHDC, to ask for help to fund his program. Boateng told Harold to contact Davis and so Harold did. When Davis didn’t reply by November, Harold emailed Davis again, this time cc’ing Boateng. Harold hasn’t heard back from Davis. “In order for us to play games there, we need the backboard fixed. Do you know somebody who can do that?” Dayon asks me. 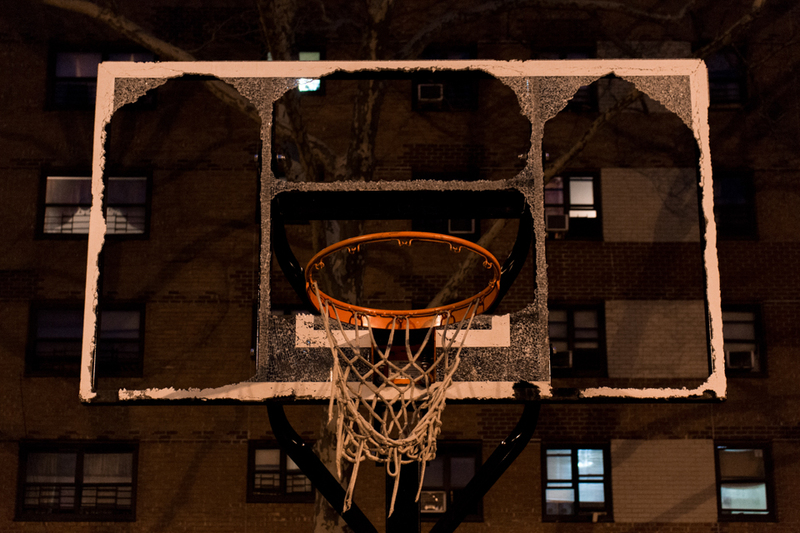 Last November, a kid shot the backboard of one of the newly installed hoops in the basketball court of Grant Houses. Now the backboard is completely shattered, making that hoop unuseable. Barely any kids play ball in the court anymore. 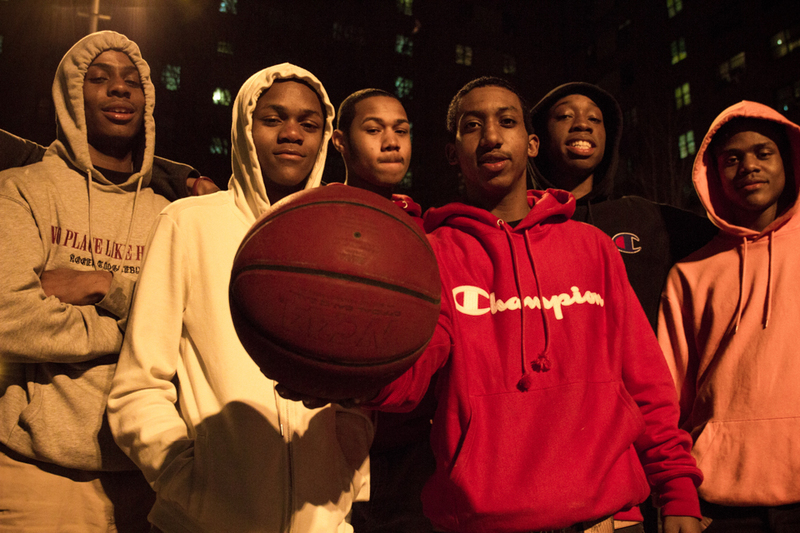 “If you grew up in a neighborhood like theirs and there was no basketball, no Harold there, could you imagine what kind of trouble they could go find?” says Tony Hargraves, the program director for the Riverside Hawks basketball program. Hargraves was raised in the South Bronx and, just like Harold, found a second home in the Riverside Church basketball program when he was in high school. When Hargraves’s son reached high school, he put him in the program as well. When Harold visits Riverside Church, he heads straight to the gymnasium. He walks downstairs and the hallway puts him into a sort of reverie. As we roam across the hallway, Harold tries to open a door but it’s locked. And then another. The momentum from the pull disrupts his train of thought. Things change, he supposes. We turn left and immediately a gust of thick air sticks to wherever our bare skin is most exposed. The sides of my neck, my cheeks, and the edge of my tongue can taste it. When we reach the hallway where the gymnasium is located on, “this,” Harold whispers. He hears the familiar tune of rubber soles sliding across the wooden floor. It gets louder and louder until he finds himself standing in the corner of the door, peeking into a Riverside Hawks basketball practice. The Riverside Hawks basketball program accepts around 350 kids, and Hargraves estimates that five or six are from the Grant Houses. According to Harold, the kids that are really good at basketball will be fine. They’ll win a college scholarship or be recruited to play professionally. Harold’s program isn’t super selective. This choice was to serve the kids who aren’t as good but still need an outlet, still need something to do, still need to feel that they’re part of something. How do you measure the success and impact of a youth program? When I meet Cortland for the second time in the Grant Community Center, the poster on the wall behind him reads: “Never Say, ‘I can’t,’ always say, ‘I’ll try’” in a spectrum of bright, playful colors. Cortland and his friends sit around the white folding table and Kendall takes the initiative to serve dinner. Right now, Cortland’s waiting to hear back from colleges. He plans on studying forensics, specifically to become a ballistics expert. When we talk, Cortland hunches over and lowers his head slightly to speak so that our conversation doesn’t interrupt the one happening amongst his friends. He plans on dorming outside of the city. Before explaining further, Cortland looks up for a moment and sees Kendall passing Dayon a plate of food. A smile appears on Cortland’s face momentarily before his friends could call him out on it. “I’ll never forget where I came from.” Cortland says. When I hear this, I think of Harold. My thoughts turn to Rev. Britton, who passed away recently. I can’t help but wonder if she had a Rev. Britton in her childhood and if that person had a Rev. Britton in their life and so on. When assessing the success and impact of a youth program, it’s not about scope but depth. Cortland tells me he plans on returning to the Grant Houses when he’s older. When he does, Cortland plans on giving back to the community, he says. “Like Harold did”.